The Situk River is home to five species of Pacific salmon, Dolly Varden trout, and the state’s largest documented run of steelhead. These prodigious runs of fish, largely a function of the high quality habitat found in the Situk watershed, draw both anglers and wildlife. You may easily access the river at several points as it meanders through spruce forests and muskeg meadows during a 20 mile journey from headwaters in the Russell Fjord Wilderness to the Gulf of Alaska. Float the river from Nine Mile Bridge to the Lower Landing (13.5 miles and approximately 6–8 hours). Bird watching from a raft or canoe, you are likely to see common mergansers and possibly red-breasted and hooded mergansers, belted kingfishers, and spotted sandpipers at stream’s edge. Waterfowl species found in lakes and estuaries may also be hiding in the side channels. Spectacular rivers, like the Situk, Alsek, Akwe, Italio, Lost, and Dangerous are some of Yakutat’s finest features. Birders can combine high quality sport fishing and bird watching. Access the Lower Situk River at Strawberry Point. The river mouths tend to be productive areas for both waterfowl and shorebirds to feed in the silt-laden shallows at low tide, especially during spring and fall migration. The foreland is an important stop on the Pacific flyway and one of the narrowest points along it. Spring shorebird migration is especially spectacular when flocks of thousands of birds dominated by western sandpiper, least sandpiper and dunlin congregate on their journey north. Spring is an excellent time to see nearly all of the North American shorebird species in their breeding plumage. The Yakutat area may be the largest stopover for the Alaska-breeding subspecies of marbled godwit. Vast numbers of waterfowl can also be expected during migration. Common migrant species include snow goose, greater white-fronted goose, northern shoveler, mallard, northern pintail, American widgeon and green-winged teal. Four subspecies of Canada goose, including dusky Canada goose, have been reported in migration, and cackling goose is possible. Hike the river along the Maggie John Trail. In a short distance, hikers will enjoy walking through a spruce forested ecosystem, arriving at the river below a fish passage weir. The trail then continues upstream along the river bank to the terminus of the trail at a portion of the Situk River called the Oxbow. This area provides outstanding opportunities for angling as well as wildlife viewing. 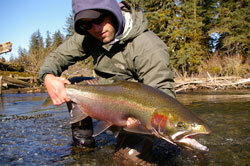 The river has outstanding clarity that allows hikers to see thousands of fish in the river during spawning periods. The riparian ecosystem that the trail traverses is home to a variety of birds, mammals and fish. 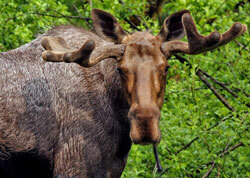 Hikers can observe bald eagles, moose and bears along the river corridor. This is also near the northern extent of the vast, luxuriant coastal rain forests of Southeast Alaska. The most commonly encountered birds here are the varied thrush, whose “gym whistle” song resonates through the trees all summer, and the Steller’s jay (a darker cousin to the familiar Blue jay) who survives here year round. Also be on the lookout for tiny old-growth species such as chestnut-backed chickadees, golden-crowned kinglets and the reclusive brown creeper. They are best detected by their high-pitched calls and songs. Finch species frequent this habitat at times. Due to “irruptive” movement patterns that follow cone crops from place to place, large flocks of pine siskin, common redpoll, pine grosbeak, and white-winged and red crossbills may be present.